Kiluan Bay in Pekon Kiluan Negeri, Tanggamus regency, Lampung, is a popular place for whale and dolphin sightings. The bay is the migration route of two kinds of dolphin, namely common bottlenose dolphin and spinner dolphin. “These two species are quite friendly with people. 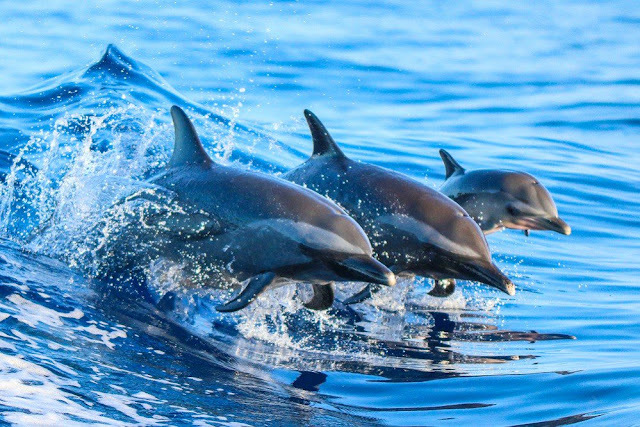 Dolphins like to swim near a boat or ship in the ocean. The best time to see these dolphins is at 6 a.m.,” said Tourism Ministry's head for convention and meetings promotions and overseas marketing deputy, Eddy Susilo. Kiluan Bay also hosts other tourist attractions named Laguna Gayau, a natural swimming pool located behind the hill of Kiluan Bay. It takes around 30 minutes to reach this place. “Local guides are available for first-time visitors; the service is priced at Rp 50,000 [US$3.71] for a round-trip,” Eddy added. To enter the laguna area, visitors need to pay Rp 5,000 per person for the entrance ticket. They will get to walk past a beautiful beach prior to arriving at Laguna Gayau. Enclosed by coral reefs, the depth of the swimming pool is between one and three meters and boasts crystal blue water. Meanwhile, Kiluan Bay is located 80 kilometers away from Lampung city, which is about three to four-hour trip by car. “In several spots visitors can expect to find shrimps cultivation areas, traditional houses of Lampung and multi-ethnic houses from Bali, Java, Sunda, Bugis and others,” said Eddy. He suggested for visitors to stay overnight at Kiluan Bay considering the best time for dolphin-viewing is at dawn. “There are plenty of hotels alongside the bay, however none of them is air-conditioned and use fans instead. Some of the lodgings are located above water and some are on the side of the hill,” he added.